There are still small joys to be had in this time when disappointments are on a scale too large to comprehend. In my twenties I used to run around at Art College in bare feet and once got hauled into a room where there was a Karate class, because the teacher wanted to show the class an ‘ideal’ karate foot – an ageing foot that was once ideal for Karate does not fit comfortably into 99% of women’s shoes. After wearing the same two pairs for the last few years, I have at last found, and bought (two very separate actions), a pair of comfortable, respectable shoes. As I sat on a sofa looking at my feet last night I felt for a moment that toddler-like wonder at the sight of my splendidly shod feet. I send my deep commiserations to my shocked American friends. We are equally shaken on the other side of the ocean. 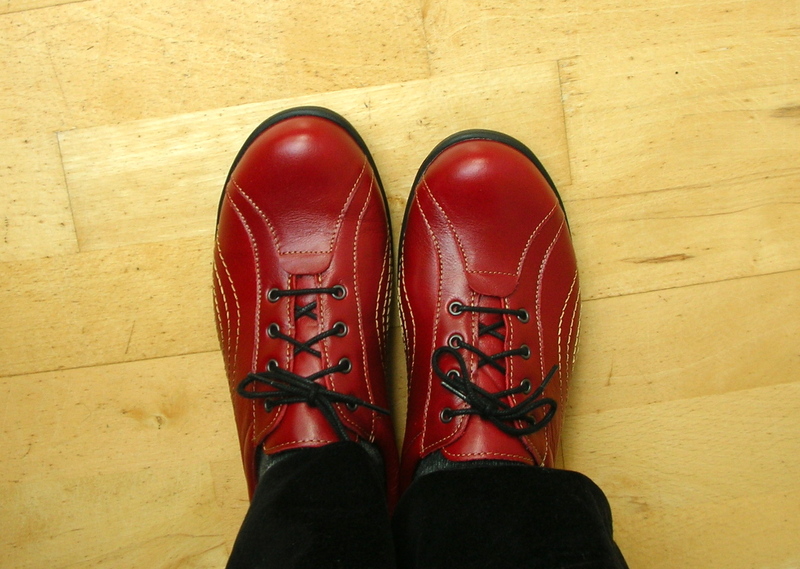 This entry was posted in Uncategorized and tagged Red shoes by hilarycustancegreen. Bookmark the permalink. Hope they are as comfy as they look. They are wonderful with room to wiggle toes. I have had a few pair of red shoes in my life and I find them magical….like Dorothy in the Wizard of Oz’s ruby red slippers, or…..oh, no! I just remembered Hans Christian Anderson’s “The Red Shoes”…..be very, very careful, Hilary, not to wear your red shoes to church, or you know what will happen…. Ah, there’s a challenge. My visits to churches are almost entirely for funerals these days (one last Saturday with an hour and a half of tributes to an ex-Master of a Cambridge College). I could use a pair of red shoes like that to soothe my election despair. My ugly man shoes don’t seem to be doing the trick. But like yours, they’re comfy. No bunions for us! The soothing was delicious, but a drop when up against the scale of the despair. Sadly, in spite of good shoe behaviour all my life, osteo-arthritis means orthotics and my short, square feet need extra deep shoes. Still, they work all, so I am not complaining. Sorry to hear it. Kudos to you for having good shoe behavior all your life though. It’s a shame the damage some shoes can do. I guess we all are shaken by the changes that will come our way. Maybe that’s is part of getting older -not understanding anymore? As for your shoes, they look comfortable and that’s all that matters. I love them! Thanks, I don’t usually like shoes much, but these please me too. I can only hope the next few years will be better than I’m anticipating. I just bought me a pair of Bearpaw winterboots. I tried them on and felt the same sensation. I hope we all are wrong and everything will be just fine. So do I… but it’s not looking great so far and we seem to have exported the least attractive Briton (Farage) to muddy the waters further. There is just something about new shoes, isn’t there, and yes, red shoes! I know that feeling. New shoes are rare for me, and they certainly have a positive effect. We on the other side of the border are shocked, too. Yes, let’s focus on something we can control: comfort for our feet. We’ll need to be very steady on our feet, all across the globe, just to get through the next few years. Hilary, those disappointments – are they all of a political nature ? You are so kind to ask. Yes, they are. There have been family health issues, but they have stabilised and all is looking good at the moment. The book seems to be getting along too and I have survived giving 5 hour-long lectures and more are being planned. Hope all is well on your home front too. Hmm, speaking of final resting places, I am reading Atul Gwande’s Being Mortal – it is a fascinating look at all things relating to our latter years, including the people managing community housing! I hope there are plusses as well as peculiarities to your new home. The shoes look great. A nice post too. It gave me a timely laugh. As for the political scene. We shall see. There is enough going on away from Trump. Australia is just about ready to start trading and swapping refugees. Yes, the timing of the refugee swap is very curious. I hope to goodness it goes through and those unfortunate people doe not have hopes raised and then dashed again. I seem to remember a film called The Red Shoes. Something to do with ballet? Yours look a bit robust for that, though. Yup, mine are no silken dancing slippers and will tramp the streets for years. I’ve never had a pair of red leather shoes before, I’m not sure what got into me, most shoes that fit my square feet are a sober black. Those are very happy shoes and a pleasant antidote to the malaise I feel myself in these days. I think that was part of the reason I chose them – anything for a small lift of spirits. I NEED those shoes. Where did you get them? I wish I could wave a magic wand and supply them to you, but I fear that http://www.widerfitshoes.co.uk is very much a UK outfit. There must be a US equivalent. I really hate buying shoes, and the first pair I ordered were too tight, but they exchanged without trouble and these are really great. Love them. Must check them out when I’m back in the UK. I’ve always been one for buying shoes by touch and having suffered as a child with badly fitting shoes. I was checking boots in a shop and they were playing Paolo Nuttini’s New Shoes. A magical moment! Well you look a bit youthful to me for searching out wider-fit shoes, but best of luck. No one ever plays appropriate tunes when I’m in a shoe shop! Matthew Bourne is putting on his version of Red Shoes soon, very exciting. These look really comfy, love the colour. I made a mistake of buying a pair of flat patent loafers off my Nana for my birthday that I thought would wear in because the leather was quite tough, several blister plasters later !!! Ah me, bad shoes destabilise the whole of you. You need to be super-comfortable at your foundations for the rest of you to reach peak performance. Look after those feet! And thanks for the commiserations. I’m still in shock. I think the world is in shock. History rolls on whatever we feel about it, so we’ll have to do our best with what we’ve got. Please! We’re counting on you…. I’m working on it as hard as ever I can, some magic takes a lot of mental effort – especially at my age. I love the shoes, and they make Elvis Costello’s “The Angels Wanna Wear My Red Shoes” loop through my brain. And, yes, thank you for the commiseration. It is a time that needs red shoes. I’m glad they bring you music. We are going to need a lot of different strategies to get through the next few years. I love your shoes! There’s something about red shoes that has always appealed to me. We all feel the horror of having such an unfit-baby man be the head of the United States. Sad! Mrs Ha wants me to buy a pair of red trousers. I think this is a step too far. What does the fashion editor think? I have a pair of burgundy brogues (Churches, I believe). That’s my limit. Red trousers? One of my brothers wears red trousers. I believe men in red trousers are subject to mockery (though I have no idea why – may signify a particular ‘county type’). 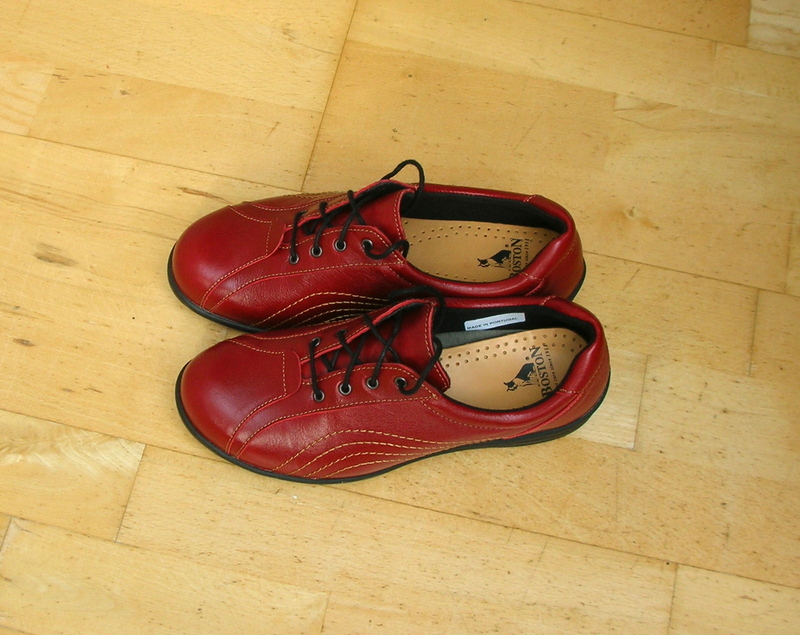 Burgundy – shoes or trousers – great and of course Churches the best. There must be a reason I have never been a fashion editor. Thank you. I hope so too, the whole world needs a less worrying future.